Dave on 7th shared this photo from yesterday from along the East River Park promenade. Someone placed memorial ribbons commemorating the life of East River Park: "We will miss your breeze, your trees, your plants and flowers and your birds and bees." This is all in reaction to the details that emerged last fall (city press release here) about the updated construction phase to protect the East Side against catastrophic flooding along the East River. As previously reported, the city plans to "lift" East River Park by up to 10 feet when work starts in March 2020. However, to do this, the city will need to close East River Park for up to three and a half years, bulldozing all the current amenities and chopping down many of the trees. The East Side Coastal Resiliency Project is currently (and quietly) undergoing environmental review. This link goes to the notice of the public review and request for comments. "All interested persons, groups, and agencies are invited to submit written comments regarding the proposed use of federal funds to support the construction of the proposed project in a floodplain and / or wetland. The City is interested in alternatives and public perceptions of possible adverse impacts that could result from the project as well as potential mitigation measures." 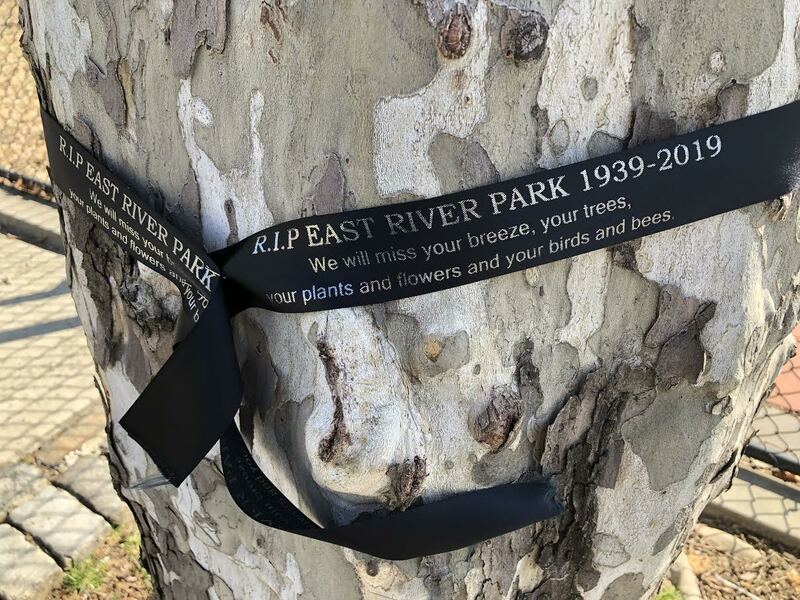 Meanwhile, a community group called the East River Alliance formed at the end of 2018 to help organize various East River Park stakeholders and to ensure that the design and reconstruction "reflects our community’s needs and values." You can read more about the Alliance in this article at Patch. Meanwhile, Mayor DeBlasio has announced his plan to save Lower Manhattan below east River Park, from the Two Bridges neighborhood down to the Seaport, Financial District, Battery Park and back up to Battery Park City. He wants to extend Manhattan Island by 500 feet or roughly two city blocks into the East and Hudson Rivers, with the blocks being built 10 feeet higher up to the rivers edge in order to withstand flooding. This solution avoids having to destroy any existing real estate, so why not do the same thing up to East 23rd Street where the flood zone extends as well? Just build new land out into the river, with additional parkland, instead of destroying what is already there. The views aren't as good? Sad comment that this is all about real estate. Not to save it... But expand the development possibilities. With record number of jobs. With record tax collection... Mayor Bill has asked hIs departments to cut their budgets for next year. The city is so badly managed that he's busting the budget at record levels of revenues. No wonder he wants more real estate... MORE TAXES... MORE WANTON SPENDING... ONE PARTY RULE... ONE PARTY RULE..
Why can't they just put a ten foot cement wall full of ivy along the FDR? I'm sure there is a reason as it seems the most obvious.